Surfing means a lot of things to a lot of people. The ‘Sport of Kings’ has existed for hundreds of years and is now enjoyed by millions across the globe through a variety of disciplines. In the mid-1970s and early-1980s, seven individuals were instrumental in the forming of professional surfing. They worked, traveled, shaped and competed when they could. And beneath any scoring system or contest format or sponsorship agreement was a burning desire to unlock the opportunity to surf for a living and the belief that surfing’s transformative abilities can and should be shared with the world. It's because of these seven Founders that 42 years later we're able to take the sport of pro surfing to new heights. So this next step is in honor of those seven, The Founders, and their dream. Wayne "Rabbit" Bartholomew has done it all: from founding the tour to winning it all in 1978, to running the ASP for a decade, making movies, writing books, and, of course, surfing his way into history. The charismatic Aussie authored "Bustin' Down the Door", the infamous 1976 Surfer magazine article that helped to usher in a new era in international surfing. Ian "Kanga" Cairns is an Aussie by birth, but did his biggest and best surfing on Hawaii's North Shore, and settled in Southern California. A passionate and headstrong supporter of professional surfing, he established the Aussie domestic circuit (ASPA), founded the US Open of Surf, and helped to start the ASP. His surfing even landed him on the silver screen - he's Gary Busey's stunt double in the 1978 epic hollywood film Big Wednesday. 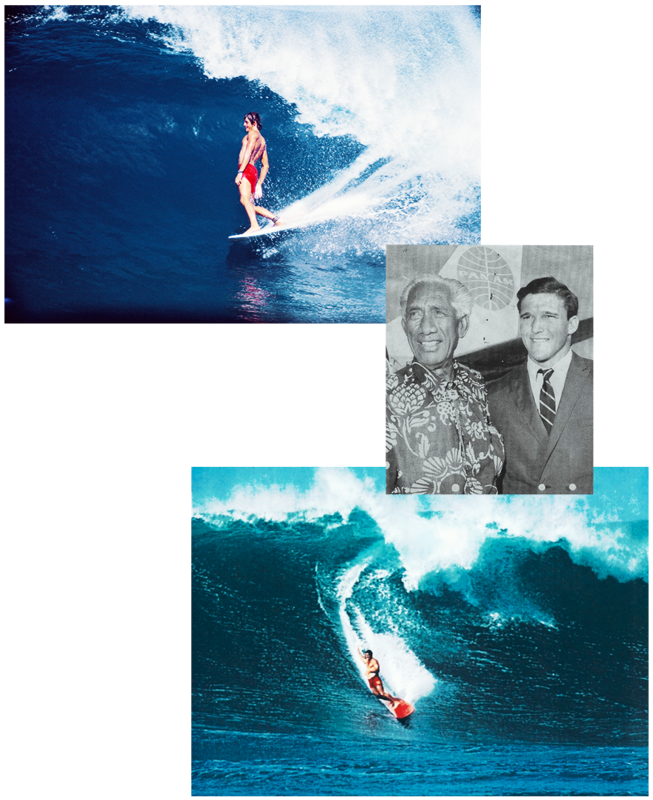 Author, "The Soul of Surfing is Hawaiian"
Born and raised in Honolulu, Fred Hemmings had a tremendous impact on the sport as we know it today. He founded the Pipe Masters and Triple Crown in addition to serving as head of the pro tour from its inception until 1982. His preference for "professionalism" put him at odds with 70's surf culture and earned him the nickname "Dead Ahead Fred". In 1984, he was elected to the Hawaiian House of Representatives. Ten years later he ran for governor of Hawaii. A campaign poster that showed a picture of Fred soul-arching through a beautiful bottom turn accompanied by the slogan: "Hemmings: He Doesn't Golf." Randy Rarick got the ball rolling as the co-founder (with Fred Hemmings) of the International Professional Surfers - the precursor the the ASP. Rarick was born in Washington, grew up in Hawaii, traveled to Australia in '68 and got the surf-travel bug bad. Over the next 30 years he would travel to over 60 surf-soaked countries, while always making an annual return to the North Shore for the Hawaiian winter. Richards earned the nickname "Wounded Gull" for his unorthodox surfing style - knees bent inward with fully extended arms - but it's a style that won him four World Titles and an undeniable place of surfing's list of all-time greats. "MR" started shaping boards at age 15, and rode a signature re-version of the twin-fin design that helped spread 'twin-fin fever' through the surf world in the 70's and early 80's. By the time he retired in '82, he had amassed a resume of surf accomplishments that still stands as one of the greatest ever. South African Shaun Thomson started as a 10 year old on Durban's beach breaks and quickly surfed his way around the world and into the history books. The 1977 World Champ changed the game during the Hawaiian winter of 1975, when he put on a mind-bending barrel riding performance at Pipeline, drawing new exciting lines and sitting deeper than anyone had before. It's reported that he often exited the tube with a joyous smile. Aussie Peter "PT" Townend has done it all: World Champ, writer, publisher, fashionista, ad man, coach, and, of course, tour Founder. He got his start on the Australian national circuit in the early 70's, and then became the first World Champion of the IPS era in 1976 at age 23. While working as a National Team Coach for team USA in Huntington Beach, Townend trained Tom Curren, Mike Parsons, Brad Gerlach, and other young Americans that would go on to shape the future of the sport.